MIAMI ZOUK THURSDAY SEPTEMBER 10!! 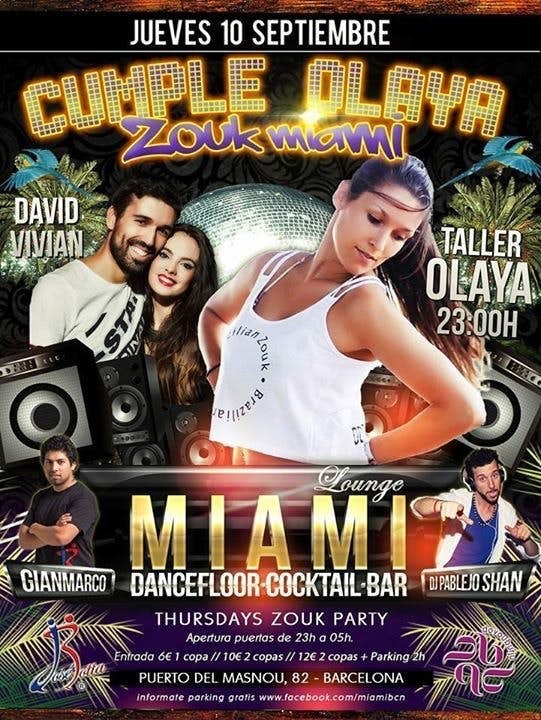 ESTE JUEVES 10 DE SEPTIEMBRE LA MEJOR FIESTA DE ZOUK Y LAMBAZOUK CON INVITADA ESPECIAL OLAYA!! CELEBRAREMOS SU CUMPLEAÑOS!!! TALLER GRATUITO DE ZOUK CON OLAYA LAS 23:00 H.
A CONTINUACÍON LA MEJOR SESIÓN CON DJ PABLEJO SHAN QUE NOS TRAE LOS HITS MAS CALENTITOS!! TERRAZA LOUNGE CON COCTELERÍA DE AUTOR. PUERTO DEPORTIVO EL MASNOU, LOCAL 82-83, 08320 EL MASNOU.